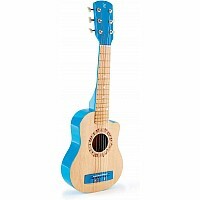 Music is a gift that lasts a lifetime, so get strumming on this beautiful blue guitar! A cross between a classical guitar and a ukulele, it's the perfect size for younger children wanting to learn an instrument. High design standard mean the guitar can be precisely tuned and produces a quality sound. 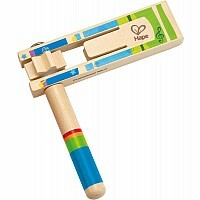 For ages three and up. Measures approximately: 26.38 x 9.45 x 3.15 inches..